Update: Versions 2.1.10 onwards now support the Adonit Pixel stylus. Download the latest version of ArtRage for iPad via the App Store. Unfortunately we have discovered that there are issues with our implementation of the latest Adonit SDK (the code that connects the stylus to the app) for iOS10, so Adonit styluses may not work properly and we have had multiple reports of problems from users. We intend to roll back to the previous version in the next update of the iPad app so that users with older styluses can paint again while we work on a fix. This means that the new Adonit Pixel will not be supported. Older styluses should work properly as soon as we roll back the update. We are working on a solution and will be adding support back in as soon as we are able. Tip: While the Adonit Pixel does not work at all, older styluses partially work. 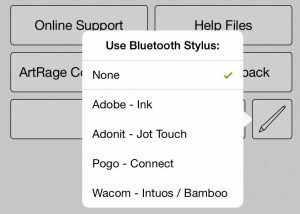 It appears that the styluses are disconnecting whenever you open ArtRage, so if you use an older Adonit stylus, re-connecting it in the Preferences every time you open the app may help you continue using it until we bring out the next update.